Christmas wouldn’t be complete in Dartford without a trip to the pantomime and the Orchard Theatre always welcomes you with a true festive treat. This year’s offering, Cinderella, is a fun family show that certainly tickles the children in the audience while granting your wishes for sparkling costumes, brilliant sets and… Louie Spence. No expense has been spared in this pantomime and the high production values alone makes audiences excited. There are gasps of joy as each new wonder is revealed, however there are some elements missing that don’t always need a big budget. I’m sure many will miss the lack of children being pulled onto stage for a laugh and a goody bag, and you know what I would have loved – a good sing song! There could have been another handful of classic ‘he’s behind you’ retorts and the like, but this is certainly made up for by two excellent joke sketches, well performed by Phil Butler as Buttons. The real winner of this show, however, is Louie Spence. He brings a presence to the stage like no other as Dandini – dancing around and cracking jokes at every chance. Look out for the comical ballet scene with Phil Butler! Michelle Collins also tops the bill although doesn’t quite live up to expectations with an awkward portrayal of Demonica that didn’t have punters booing too quickly. 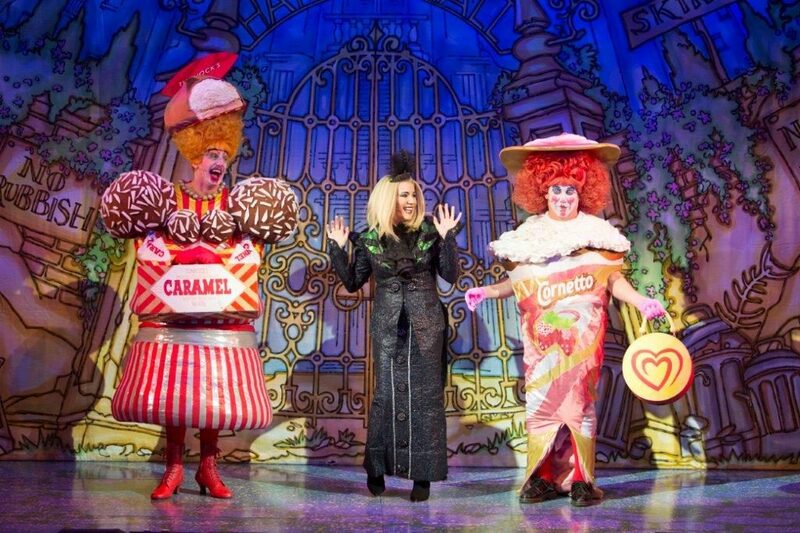 The Ugly Sisters, Simon Jessop and Charles Brunton, are quite the pair of dames, showcasing some truly awful yet spectacular fashions throughout the show. Prince Charming himself, Luke Kelly, is an obvious hit with the ladies and Cinderella, Jayne Wisener, is as sweet as ever. Together they produce some great singing numbers in a soundtrack that is full of hits. The act one finale is quite the showstopper, complete with a glittering carriage and some furry friends that certainly delight the children watching. Overall you can’t go wrong with Dartford’s contribution to the pantomime season. Go for Louie’s performance, some real laughs and the top quality production efforts. It may not have all the classic elements but, that said, make sure you don’t miss your chance to go to the ball in Dartford this year! Buy your tickets for this year’s Orchard Theatre pantomime from the box office or online, with performances running until 31st December.